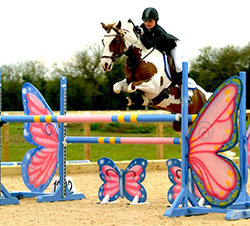 Langstaffe Donnerstag is a kind genuine pony, who lives at home on a mixed yard and is an ideal pony to produce show jumping, dressage or show ponies of hunter type and Part-Bred Arabs. 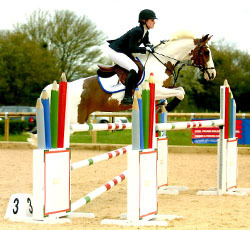 You can see one of his daughters coming 2nd in a Foxhunter class in November 2014 on YouTube here and there are other video links in the progeny section below. 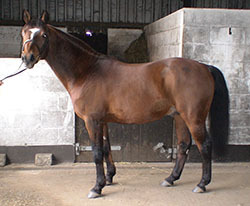 Domsberg was BWBS champion stallion and rated in the top sires of British dressage horses, he competed in BSJA classes and is from a prolific line of German (Hanovarian) dressage horses. He can trace his D line to a TB stallion, Devil’s Own. 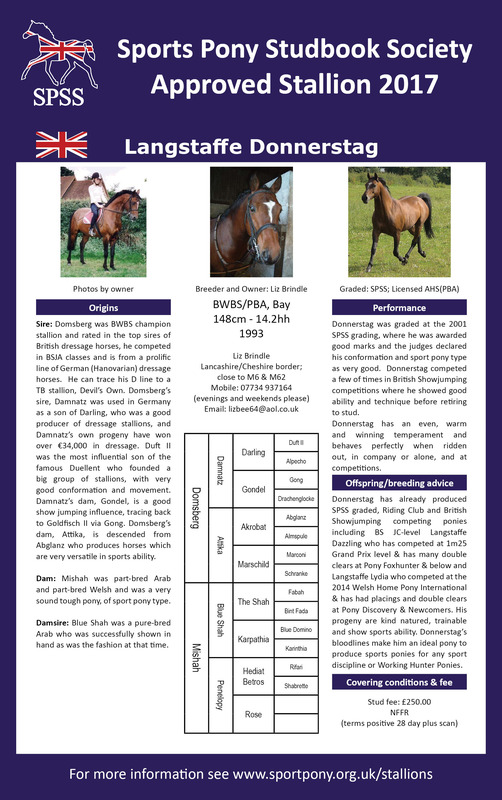 Domsberg’s sire, Damnatz was used in Germany as a son of Darling, who was a good producer of dressage stallions, and Damnatz’s own progeny have won over €34,000 in dressage. 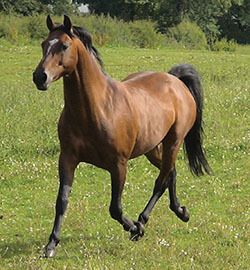 Duft II was the most influential son of the famous Duellent who founded a big group of stallions, with very good conformation and movement. Damnatz’s dam, Gondel, is a good show jumping influence, tracing back to Goldfisch II via Gong. 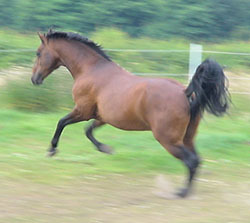 Domsberg’s dam, Attika, is descended from Abglanz who produces horses which are very versatile in sports ability. 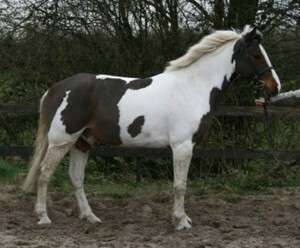 Mishah PBA/PBW was a very sound tough pony, of sport pony type. Blue Shah was successfully shown in hand as was the fashion at that time. 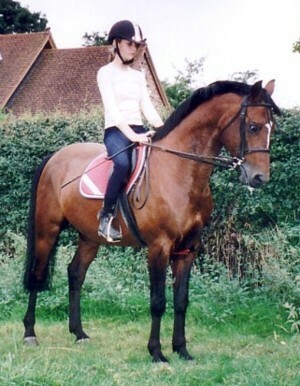 Donnerstag was graded at the 2001 SPSS grading, where he was awarded good marks and the judges stated his conformation and sport pony type as very good. 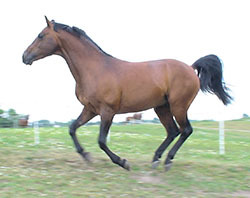 Donnerstag competed a limited number of times in BSJA competitions where he showed good ability and technique before retiring to stud. He has an even, warm and winning temperament and behaves perfectly when ridden out, in company or alone, and at competitions. 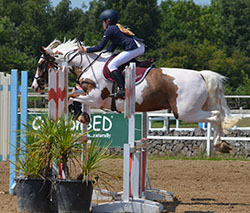 Donnerstag has already produced SPSS graded, Riding Club and British Showjumping competing daughters including Langstaffe Dazzling (top left) and Langstaffe Lydia (bottom left) pictured competing at the 2014 Welsh Home Pony International. 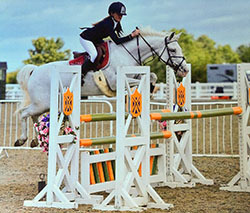 Langstaffe Dazzling is also pictured on the right in her first 1m25 Grand Prix ridden by her owner Georgie Burchmore in April 2016. 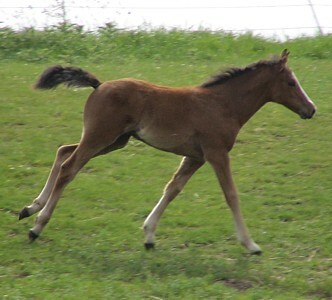 His progeny are kind natured, trainable and show sports ability. 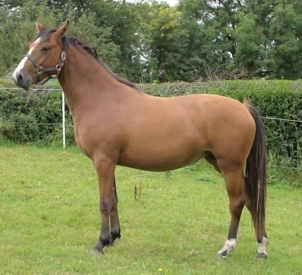 Donnerstag's bloodlines make him an ideal pony to produce sports ponies, in any sport discipline, or Working Hunter Ponies. See Langstaffe Distraction at rising 5 on YouTube here and here or look further down the page for more progeny photos and video links. 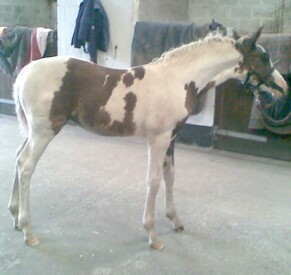 Coloured Colt. 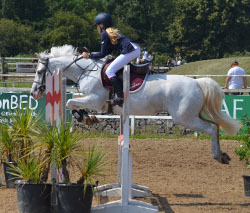 Dam: Tarbocks Tinker (SPSS Elite & JA pony). 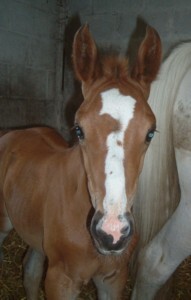 Born 7 June 2010. 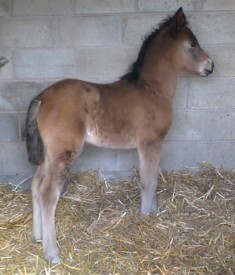 Breeder Liz Brindle. 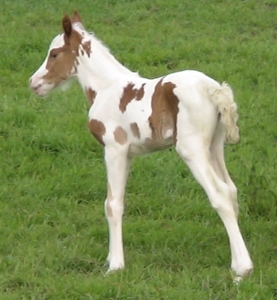 Pictured as a foal and at his first show (aged 4) in 2014. He can be seen competing in early February 2015 on YouTube here and here. 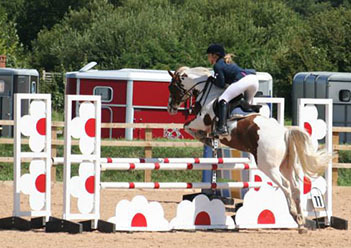 Dazzling is pictured as a foal and as a 5 year old in her first Senior British Showjumping classes (2012). 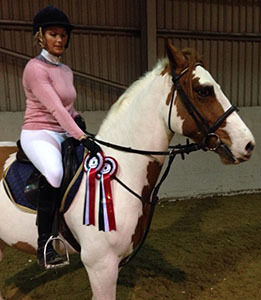 2014 Welsh Home Pony International. 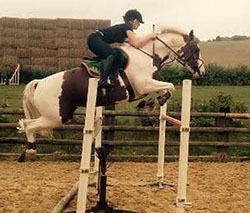 Langstaffe Distinctive, (out of Elite SPSS International Showjumping pony Tarbocks Tinker) pictured at rising 4 years and now training for a BSJA career. 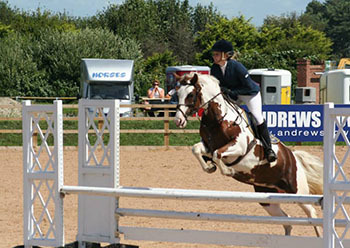 His eldest daughter, Langstaffe Evening Darling (right), was born in 2000 and attended the 2004 SPSS grading and gained good marks. The judges singled her out for praise as she behaved much older than her years. With her sensible level-headed nature and attitude, she took her new experience in her stride. 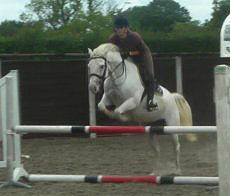 They were also impressed with her rideability and jumping ability which they felt had good potential. 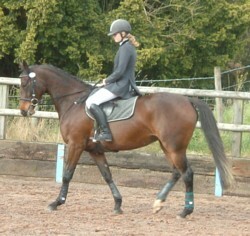 They said she gave a pleasing general impression and showed willingness and rideability throughout the day. 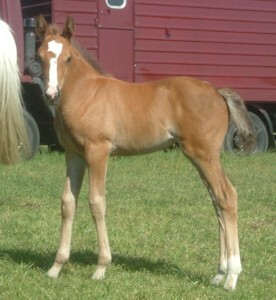 Bay filly foal pictured at 3 to 4 weeks old out of SPSS Elite graded International Showjumping mare Capital Liza, this is her second foal by SPSS graded Langstaffe Donnerstag. 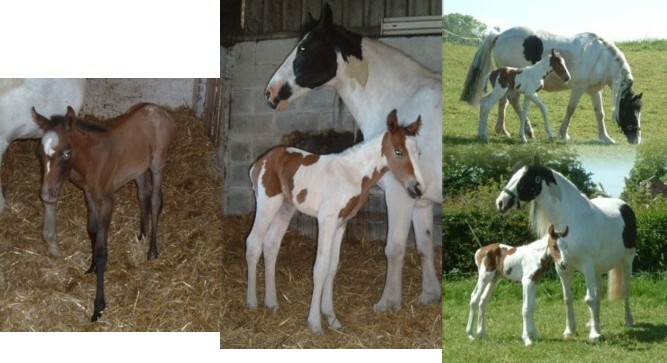 Left: Langstaffe Lydia, filly, ex Elite SPSS International Showjumping pony Capitall Liza, born 20 May. 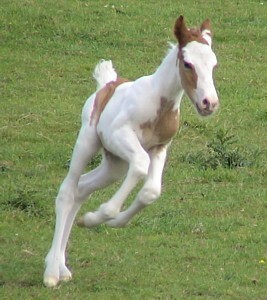 Photo taken at 15 hrs old.